I am a member of a Facebook group for my little neighborhood in Grand Forks, North Dakota: the Near South Side. Recently the conversation has turned to traffic flow through our neighborhood largely in response to a study of traffic flow across the town and a more specific study of traffic flow in the Near South Side. I’ll probably blog on this at some point (and it’s a bit more interesting than it sounds! ), but the conversation got me thinking a bit about stop signs. For whatever reason, I’ve always been a bit interested in stop signs. I have long kept a little tally in my head of my favorite stop signs in town and find their assertiveness and confidence a reassuring reminder that authority still exists even in such a completely impersonal form. Beyond their brash confidence, stop signs also tell specific individual stories. Some remind us that there are other people in the world who have places to go that are every bit as urgent – and maybe more so – than you. The most iconic signs control the flow of traffic across busy intersections. Others simply remind you to slow down, take it easy, and to enjoy your journey. These are traffic calming stop signs. Some stop signs are aspirational. They stand at isolated intersections and tell us that while it might not look like much now, in a few years, this intersection will be bustling. Some are historical reminders that an intersection used to be something more than it is now, and these signs stand out of time and place in the changing landscape and traffic flow. In short, stop signs tell stories and the relationship between the traveler, the sign, the space, the community, and the planner who suggested that a stop sign should stand at a particular intersection is part of how we produce a sense of place in our world. A whole essay could be written on how this sense of place – on the corner or at the crossroads – can become menacing, welcoming, confusing, relaxing, or ultimately lead you to sell your soul to the devil. In any event, over the past decade or so in Grand Forks, I’ve created a little list of my five favorite stop signs. The list has a changed a bit over time as my routines and routes have changed, but as it stands now, I think it reflects my sense of place in town. 1. 8th and Reeves. This is the stop sign nearest my house and I’ve spent many a long summer evening watching cars approach this unusual intersection from the south on Reeves. These northbound cars come to a complete stop only to realize that they aren’t sure entirely how traffic flows through this intersection as the cars heading south on Reeves also have a stop sign, despite the fact that the two roads do meet in the middle of the intersection. Other drivers confidently roll through the intersection craning their necks to the west to make sure that traffic isn’t heading east toward them on 8th. Some stop and then inch forward looking all the while to the the west, and others – especially approaching the intersection from the north – barely glance to the east, before cutting the corner and turning south on Reeves to continue their journey. Many of the drivers are merely passing through this intersection on their way south or north to or from the Point Bridge that crosses the Red River and links our town to East Grand Forks, in Minnesota. The intersection also marks a change on Reeves drive where the more modest turn of the century homes give way to the houses of the local elite that line the most prestigious stretch of road in town. 2. 3rd Street and 1st Avenue. This intersection is in the heart of downtown Grand Forks. Third Street is the home to restaurants and bars as well as condos and apartments that embody the idea of a walkable downtown. In the summers there are planters along the street and some of the bars and restaurants install temporary decks to allow folks to enjoy outdoor seating. In the winter, there are lights stretched above the street which glitter off the snow and give the district the feeling of the winter holidays. There’s a stop sign on 3rd Street that I suspect is designed to slow the flow of traffic down 3rd street and make it easier for pedestrians to cross the street. 1st street isn’t really a busy road largely because it ends one block later in a parking lot and the flood wall. There are just so many distractions along this road, and the stop sign is pretty far from my line of sight. As a result, I end up running this stop sign maybe once a month (or at a rate of one time for ever 15 drives down this road). Because this part of downtown is busy, I’m usually driving slow so it’s not that I’m in hurry to go somewhere else. In fact, I usually realize that I’ve run the sign and stop in the middle of the intersection, which probably serves the spirit of the stop sign even if I don’t embrace its legal insistence that I stop on a particular line. Whenever I stop or run this sign, it gives me a little smile. 3. 13th Avenue and 14th Street. This stop sign transports me to a different time and place. 13th avenue is a “major collector” road in the formal terminology of traffic planning, and we often use it to get across town. Despite that, the intersection of 13 avenue and 14th street is an unusual one for me. It occurs one block to the west of 13th Avenue crossing a major, four lane road, Washington Street, and, as a result, 14th street feels something like a service road running along the back of a strip mall and a car dealership. The businesses at this intersection feature a couple of auto repair establishments and a laundromat. A rather rough looking mobile home park stretches along the west side of 14th street to the north. The vibe is distinctly small town and rural, despite being just a block from a suburban stretch of Washington Street with a McDonalds, a strip mall, a DQ, and until recently a Starbucks. In fact, this intersection reminds me of the small towns in the Western North Dakota where people are getting by just fine, living their lives, working in small businesses, and on a sunny afternoon might be more than happy to stop and have a chat while their laundry finishes at The Bubble Laundry Co. or they get their brakes done on their 2003 Ford F-150. These moments of reverie and displacement have predictable results. Once ever ten trips through this intersection result in me slamming on the brakes at the four-way stop (or even running the stop sign entirely). The change from the bustling but predictable flow of Washington and the near-suburban feeling of 13th on the east side of Washington to the small town intersection feeling at 14th and 13th never fails to disrupt my mindless drive across town. 4. Reeves and 9th Avenue. This intersection was basically terra incognito to me despite being just a block from my house. I walk south on Reeves periodically and sometimes even jog, but I never think about this intersection at all and probably mindless cross 9th avenue without even a deliberate check to see if there’s traffic. This makes a certain kind of sense, though, because there isn’t much traffic on 9th Avenue which ends at the flood wall just a block to the east of this intersection. There is traffic on Reeves of course, as I explained above. Many commuters use Reeves to avoid the busier routes of Belmont (a minor arterial road) or Washington Street several blocks to the west (which is a principal arterial to use the pleasantly biological terminology of traffic analysis). I almost never use 9th because it is laced with stop signs between Reeves and Washington, although I will admit to sometimes driving west on 9th just to enjoy the unusual “yield” sign at 9th and Oak. This is clearly one of those stop signs installed to slow the flow of traffic along Reeves because if this intersection needed a stop sign to control traffic, it would make more sense to have it on 9th which is already a stop sign aficionados paradise. In fact, because I rarely drive south on Reeves, I almost never think about this stop sign while in my car. I think I’ve likely run it a few times because it is so unexpected and the road is close to home and I’m usually turning west on 9th before entering the alley between Reeves and Belmont. I started to notice this stop sign, however, when I started to ride my bike more regularly in the summer and fall. I generally proceed down 9th to Almonte and then to the Greenway bike paths. For quite some time it struck me as oddly courteous that folks would stop for me as I crossed Reeves on 9th. I now know it’s because there’s a stop sign there. Maybe the best stop signs are ones that you don’t notice? 5. 20th Street and 36th Avenue. For me, this stop sign is always being its best stop sign. It simply works. I usually proceed through this intersection on 20th Street heading south toward the dogs’ club on south Washington after running errands on the bustling principal arterial that is 32nd Avenue. Usually I turn south out of Happy Harry’s Bottle Shop at around 5 pm on my way to get the dogs and head home for the day. It’s not the first intersection south of Happy Harry’s, but it’s the first notable intersection. More than that, it feel like this intersection is a gateway to the new, more suburban and sprawling Grand Forks that I call, in my head, the Far South Side. There are apartments here sprouting from agricultural fields and massive athletic complexes, new schools, new health care centers, and new versions of venerable Grand Fork’s businesses arrayed in strip malls along Washington Street. This stop sign embodies some of these changes in town. It’s a four way stop that often has a few cars waiting for their time to proceed. There is great visibility because the intersection sits amid new construction that is politely set back from the road and which frame the open spaces to keep your attention on the palpable bustle of this new suburbia. It’s an aspirational intersection, in some ways, which welcomes the driver heading south to new things (even if these new things are, the same old suburbs). It gives you a reason to stop and take stock. Maybe someday, there will be a stop light here, but for now, the stop sign seems to tell me that there is more to come. Confusion Corner: There is nothing more interesting than both stop signs and yield signs. 6th Avenue and 15th St. (and Washington): Something about stop signs on frontage roads that just gets me right in the feels. Belmont and 62nd Ave.: This stop sign is both useful and aspirational. Over the last few months, I’ve been writing some short essays on small town life for theNorth Dakota Quarterly blog. I like to try them out here first, but here are the others: The Dog Park at the End of the Universe, In Praise of Trucks, Alone Together in a Small Town, Bump outs, Logistics, and Citizenship in a Small Town. I pretend that they’re chapters in a fictional book of essays on life in Grand Forks, North Dakota. Grand Forks is a pretty interesting little town if you pay attention to what’s going on. This past week, the long simmering news became pubic that Lyon’s Garage, a Tudor Revival style building built in 1929. It will be replaced by a predictably bland, brick-clad, steel and glass “mixed use” building with commercial or retail space on the ground floor and modern apartments above. What has drawn my to the story of Lyon’s Garage is that it is the last operating business from the old automobile district in downtown Grand Forks. 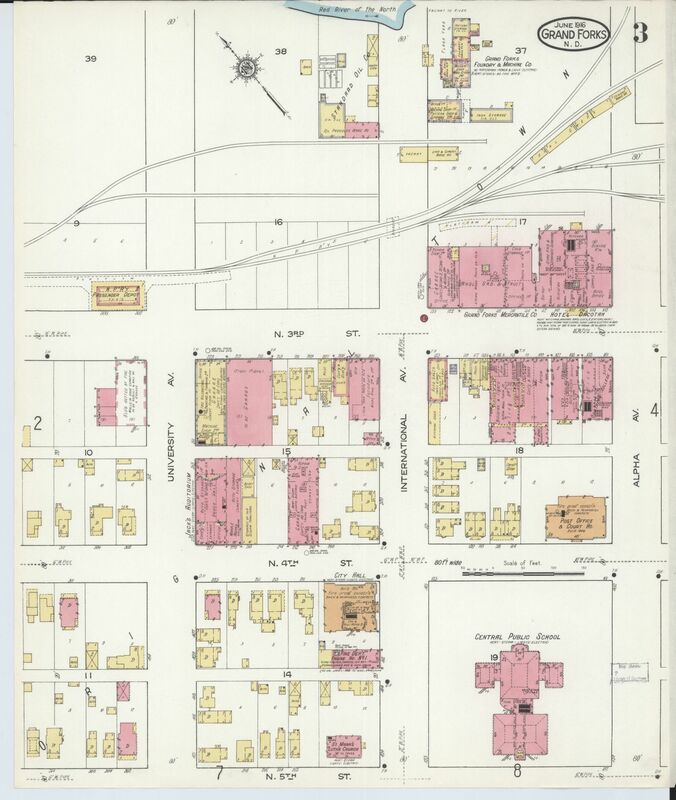 According the National Register nomination and a quick scan of the Sanborn Maps showed that as early as 1916, the northern part of downtown Grand Forks had become home to a number of garages and auto repair businesses. Their location at the edge of the commercial district downtown was convenient because it provided access to travelers on the Meridean Highway and the U.S. Route 2. Travelers stopping in Grand Forks could get their vehicles serviced or park their cars over in one of the several garages in the area. Grand Forks residents could purchase their vehicles in this neighborhood as well, and Lyon’s Garage sold some rather more obscure brands – including the humorously named Hupmobile – across the street from the Oldsmobile dealer. To the northeast of Lyon’s stood the Norther Pacific passenger depot and to the southwest was the Great Northern railway siding in town. In other words, Lyon’s Garage stood amid a network of roads and rail connection linking Grand Forks to the rest of the nation. The decision to tear down Lyon’s Garage speaks a bit to how we current view the history of Grand Forks. There is no doubt that a light industrial outfit like Lyon’s fits awkwardly within the developing plans for the city. The emphasis on making downtown Grand Forks a walkable city with street level shopping and higher density residential space makes the rather single-story buildings with generous set backs rather less efficient uses of space. In fact, most efforts to promote new urbanism frown on the inefficient use of space associated with downtown car dealerships, even though they were a regular feature in mid-20th century communities (See for example, the efforts to move Select Ford from downtown Williston, North Dakota.) The effort to reimagine downtowns remain steadfastly nostalgic, however, even as they overwrite part of the urban past in the name of new urbanism. The loss of Lyon’s Garage – and the closing of Odin’s Service Station on Belmont – mark two of the older, and continuously functioning, monuments to Grand Forks automotive past. The automobile and Grand Forks developed more or less simultaneously and even today single family homes and tidy neighborhoods extend north and south along the thoroughfares that follow the line of the old Meridian highway. In effect, Grand Forks was designed for sprawl and suburbanization. The disappearance of Lyon’s Garage (and possibly Odin’s!) erases some of the historical monuments that defined the early-20th century character of Grand Forks. It’s interesting to think of places like Lyon’s Garage as an expression of the tension between Grand Forks as a “logistics city” that supported the regional and national flow of material through its borders and Grand Forks as a central place that privileges residents over participation in the global supply chain. The auto district of Grand Forks, served the movement of people and goods through our community (as well as residents). More than that, it embedded the mechanics of Grand Forks as a logistics city in its urban fabric. The rail lines, auto district, warehouses, and boarding houses that characterized the northern and western parts of downtown created opportunities for genuine mixed use development. Over the past decade, however, many of the older light industrial sites in Grand Forks have moved further outside the city, in part to take advantage more, cheaper space and better connections to rail and the interstate. This shift to industrial activity outside the city itself, however, impacts downtown as it transforms the diverse environment supported by genuine mixed use urbanism into a more homogenized space of commercial, retail, and residential. In fact, the absence of light industrial activities in the urban core may well mitigate against a certain amount of economic diversity as these installations likely syncopated the spread of higher rent and high cost development that would ensure both space for less well-heeled operations and moderated the expense of downtown living. The risk of a downtown built on higher cost residential, white collar commercial, and retail and service is that the folks who work in those street level retail outlets and in the service industry can’t live downtown. As a result, they have to drive to work in the walkable urban core. As a brief coda to an admitted rambling post, I was struck by the rise of new businesses in town that have adopted the formal character of the garage. Sickie’s Garage for example, is a burger place that initial built a garage-like building well outside of downtown before moving into a restaurant space in East Grand Forks that they have decorated to look a bit like a garage. Vinyl Taco, another new eatery – uses garage doors to open their restaurant to the outdoors during the three or four weeks a year which this is desirable. While, I’d be loath to suggest that a place like Lyon’s Garage or Odins become local “bar ’n’ grills,” but they stand as nice example of our nostalgia for these kinds of light industrial landscapes. The visible presence of brewing equipment in both of the downtown breweries similarly evokes and tempers urban industrial landscapes making them safe for upscale retail and service. All this both reminds us of a more dynamic urban past while keeping the smells, working class people, and noise of real industrial work at a distance. It’s a local version of the famed Meat-Packing and Garment districts of New York City. All this is to say that it will be a bit sad to see Lyon’s Garage disappear. It’s not that it was such a remarkable building or that I even patronized the business (I did, however, got to Odin’s regularly), but I do appreciate what that kind of business stood for in a town like Grand Forks and wonder whether our walkable future would do a bit better to preserve the working class landscape of our city’s automobile past. There’s a lot going on over the next month at The Digital Press at the University of North Dakota. If you want to be in the loop follow The Digital Press on Twitter. The Joy of Voting website and Facebook page will be updated daily with a new memory of voting as a joyful experience. Depending on the response to the page, we might put together a little digital book celebrating voting in Grand Forks. Recently, there’s been a pretty interesting debate in my little town on bump outs. Bump outs are a form of curb extension generally designed to protect pedestrians crossing busy streets by narrowing the road and slowing traffic at intersections. The Grand Forks City Council has installed a few temporary bump outs in downtown Grand Forks on an experimental basis and, as one might expect, they have attracted both positive and negative comment. What’s been particularly interesting to me is that the conversation around bump outs has tended to pit perceived “liberals,” who are in favor of the bump outs because, it would seem, they cost money and liberals tend to favor public spending against conservatives who are skeptical of public spending especially on things that smell a bit of the nanny state and might inconvenience the flow of private vehicle traffic through the city. This juxtaposition in a curious one. After all, the so-called liberal position has little to do with some uncontrolled need to spend public funds, and almost everything to do with the desire to improve downtown Grand Forks. In fact, since, as far as I know, Grand Forks doesn’t have a problem with pedestrian injuries, the bump outs are not even explicitly designed to solve a problem, but to demonstrate care or concern for producing a walkable city. The desire to produce a walkable downtown is not exactly a neutral thing. At its best, it demonstrates an interest in reducing our dependence on motor vehicles and fossil fuels, producing a higher density and, as a result, more efficient and cost-effective living space, and building a stronger sense of community through increasing the opportunities for interaction between neighbors and residents. At its worse, it reflects an investment in urban property values by building an appealing mixed-use downtown that is attractive to private investors and susceptible to gentrification. Downtown Grand Forks is developing rapidly with new housing being built, new businesses being started in existing buildings, and new offices. The private concerns who have invested in these properties see a good partner in the city government who is willing to commit public funds to increase the value of their investments (and, inasmuch as these things are related, the quality of life for folks living and working downtown). The interest in bump outs is consistent with the recent willingness to sell downtown “pocket parks” to private investors for development. The desire to partner with private investors to increase urban density downtown is a rather direct example of using public funds to bolster the private sector. It is hardly surprising the most politically powerful developer in the U.S. made investment in infrastructure a key talking point in his campaign. Developers love infrastructure because it builds value for their portfolios. New urbanists also love infrastructure investments because higher density, high value development is a more efficient way to produce tax revenue for communities because infrastructure costs per resident (and per physical footprint) are lower in high density downtowns than in suburban sprawl. The more revenue the high density urban center can produce, the lower the taxes for everyone in the community. It is ironic that bump outs appear to be some liberal ploy to spend public money “willy nilly” when, in fact, they’re part of a pretty well-established strategy to use public funds to support private investment. Moreover, the kind of high density downtown favored by hipster new urbanists also supports lower taxes for suburban libertarians who prefer the freedom of more dispersed settlement closer to city limits. Some of the folks who opposed the bump outs are equally interesting to me. I’m not particularly interested in folks who just oppose everything (and this is a rather popular political position in any small town, I think). After all, it’s easier to object than the plan. The more intriguing argument concerning bump outs is that they will disrupt the flow of traffic through downtown. This brings me to my recent interest in logistics. A number of authors have noted that the late-20th century expansion of the global supply chain has changed the nature of urbanism and citizenship in key ways. For some, this involves the emergence of “supply chain citizenship” which involves a sense of loyalty to a series of economic relationships mediated by transnational corporations. In many cases, this involves buying a particular product because it is produced in an ethical way (think: free trade coffee), but this can also involve supporting corporate interests in one’s community even when they run counter to the traditional government institutions. In the latter case, this reflects both a skepticism toward the role of government which is seen as either corrupt, incompetent, or fundamentally opposed to the free functioning of markets and the growth of wealth, and a greater confidence the interest and ability of a private concerns to care for its workers and communities. In a 21st-century twist on company towns, supply chain citizenship reflects a willingness to contribute to global corporate well being imagining that the rising tide of corporate profits will lift all ships or, at very least, that a sense of shared responsibility for corporate profits (or ethical behavior) will be recognized and reciprocated across the supply chain. Returning to bump outs and logistics on the local level, the most compelling argument against bump outs is that they will disrupt the flow of traffic through the city. While Grand Forks can be busy, it is largely busy in a small town way, but the relatively easy flow of traffic through the community should not disguise the role of Grand Forks in larger supply chains. Grand Forks, like all cities, is a “logistic city.” Situated at the intersection of US Route 2 and the Meridian Highway (now, US 81 and Interstate 29), home to the largest flour mill in the U.S., and a stop along the Great Northern Railway’s “Hi-Line” connecting Minneapolis to Spokane and served by the Empire Builder, Grand Forks always stood as a node in the continental flow of goods. In other words, the origins of Grand Forks has always asked its residents to think globally about the function of their city. The flow of traffic through Grand Forks fortified the city’s existence and played a role in its development as a regional hub with banks, municipal services, transportation facilities, a university and hospitals.